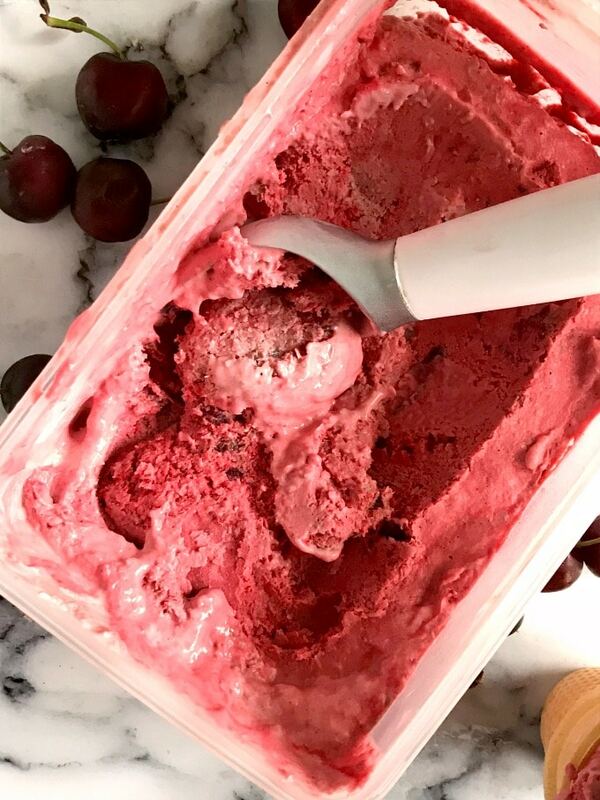 No-Churn Cherry Ice Cream Without Condensed Milk, the very best homemade ice cream recipe. 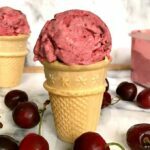 Nothing beats a good old ice cream on a hot summer day, and this cherry ice cream is all you need to cool you down. Ice cream!!! What would the world be without it? Long are the days when ice creams were available only in summer time, now you can buy them all year around from pretty much any shop in the world. Thousands of flavours and colours, some heathier than others, some more delicious than others. If you like a good ice cream, this is the recipe for you. Made the very old fashioned way with milk, cream and eggs. 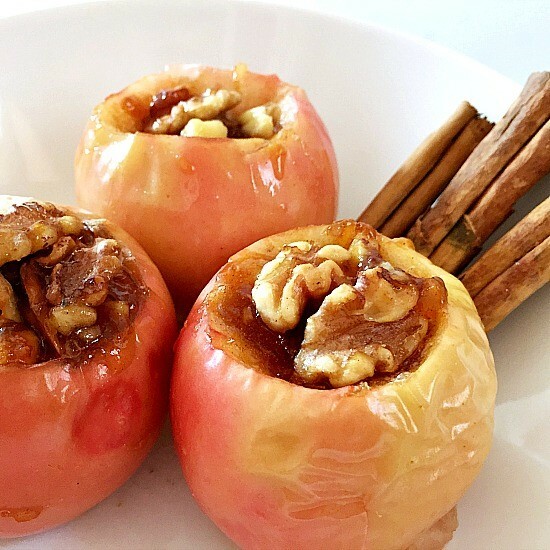 Simple, but yummy. Now, most no-churn recipes use condensed milk, which, to me, it’s a tad too sweet. Not to say it’s not delicious, but, even my sweet tooth finds the condensed milk too sweet. Yes, it might be quicker to make, but why not make it the proper way, and you get a basic recipe which can be tweaked to your own liking. And once you have the base, which is vanilla flavoured ice cream, then you can add pretty much any flavour to it. If you want to try my vanilla ice cream, this is one delicious summer treat! How do you make no-churn ice cream without condensed milk? The basic ingredient for a homemade ice cream are milk, double cream (heavy cream), eggs and sugar, plus the flavours of your choice. Make sure they are all at room temperature! First, beat the egg yolks with sugar until you get a smooth pale-yellow paste. In a pan, bring the milk to a boil, add the double cream, vanilla seeds and vanilla sugar. Pour the milk mixture over the eggs, whisking continuously to avoid the eggs scrambling. Return the pan to the heat, and continue to whisk until it thickens slightly, and the mixture coats the back of the spoon. DO NOT OVERCOOK, as it will curdle. Remove from the heat. How do you add fruit to a homemade ice cream? Pit the cherries, add them to a blender and blend until smooth. Do NOT add the cherry blend to the ice cream at this stage. The mixture will have a high water content and the ice cream will be too icy. So, transfer the blend to a pan, bring to a boil, and cook until reduced to half. Add the cherry mixture to the ice cream, and mix well to combine. Food colouring is entirely optional here, but when you mix the fruit puree with the ice cream, the colour you get is a rather pale pink, rather than a deep pink. That’s because of the egg yolks used, the vanilla base is a pale yellow, so the pink would not come as strong. How do you avoid ice crystals in homemade ice cream? If you ever tried to make ice cream without an ice cream maker, one of the most frustrating problems you come across is the rather icy texture. That’s because normally the ice cream maker will churn it and give the ice cream that fluffy, creamy, perfect texture we are used from the store-bought ice creams. But that’s not to say you can’t get close to that with your homemade ice cream. 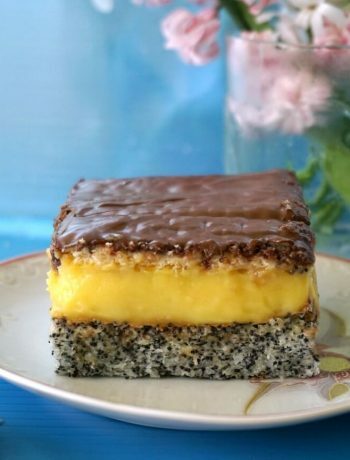 Now, some say the more sugar you use, the creamier the texture. But I’d rather not eat tons of sugar just because I want creamy ice cream. It is best to store the ice cream in an air-tight plastic container, I used one with a capacity of 1.3 litres, and it was large enough for the amount of ice cream I made. 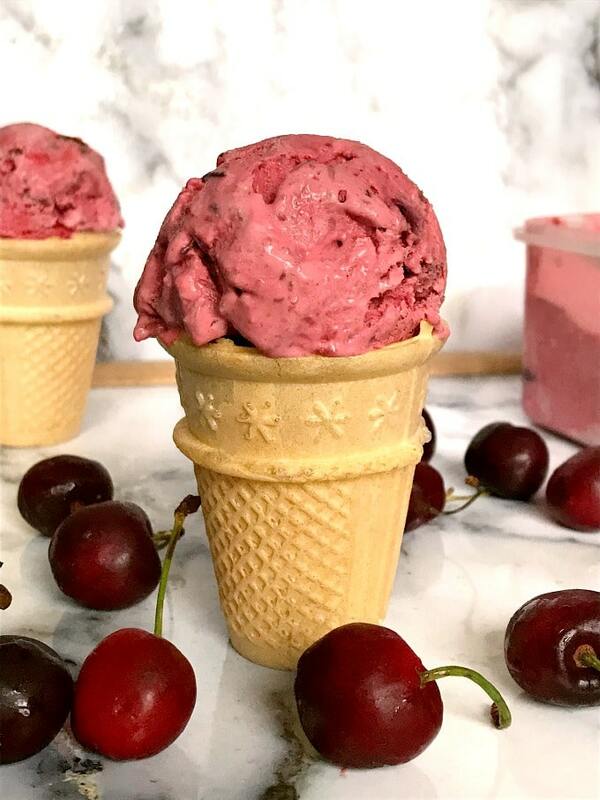 If you’ve tried my HOMEMADE NO-CHURN CHERRY ICE CREAM WITHOUT CONDENSED MILK or any other recipe on the blog then don’t forget to rate the recipe and let me know how you got on in the comments below, I love hearing from you! You can also FOLLOW ME on FACEBOOK, INSTAGRAM and PINTEREST to see more delicious food and what I’m getting up to. Add the pitted cherries to a blender, blizz until smooth, then transfer the content to a pan. Cook on a low to medium heat until it is reduced by half, and it forms a thick sauce, depending on the heat that should take about 10-15 minutes or so. Beat the egg yolks with the granulated sugar until you get a pale yellow colour. 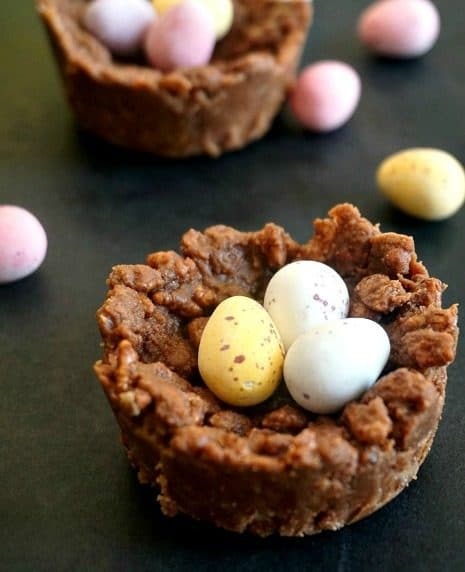 Separately, bring the the milk, double cream, the seeds from the vanilla pod and the vanilla sugar to a boil, then pour the mixture over the eggs whisking continuously, in order to prevent the eggs from scrambling. Transfer the whole mixture back to the pan, and cook on a low heat whisking again until it thickens slightly. Do not overcook, as the mixture will curdle, to test if it is ready, see if it coats the back of a spoon, if it does, take it off the heat and leave to cool completely. Add the cherry sauce to the milk mixture, then pour everything into a plastic container that has a lid. You can chop more cherries and scatter over the ice cream mixture. You can stir the mixture 2 or 3 times every hour or so until it freezes, in order to avoid ice crystals from forming. If it's too frozen to be scooped, leave outside on the counter for about 30 minutes or so before serving. See the post for more tips on how to make the perfect homemade ice cream.